Google+ Reading Teen: THE RULE OF MIRRORS by Caragh M. O'Brien // A Middle Book That Breaks The Mold.. 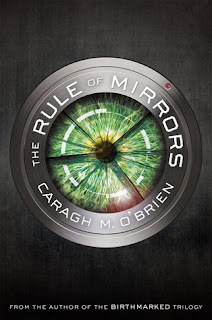 THE RULE OF MIRRORS by Caragh M. O'Brien // A Middle Book That Breaks The Mold.. The Rule of Mirrors is the second book in the Vault of Dreamers trilogy. This is fantastic roller coaster ride of a story! I have found that typically middle books are ho-hum and not as thrilling as the first or the last but this one breaks that mold. This story is told from two different points of view: Rosie who was left behind in the vault of dreamers and Rosie who was planted as a dream seed in the body of a girl who was brain dead after a tragic vehicle accident. Both have two very different lives but both have to figure out how live in their current bodies. Rosie in the vault is still being mined but has an admirer named Ian who lets her wake up from time to time. Ian is an incredibly creepy character that has fixated romantically on Rosie, pretending she is his girlfriend. Rosie has to figure out quickly how to use Ian to get out of this dream vault and make her daring escape. Once Rosie does manage to escape, she teams up with Burnham to figure out a plan on seeking revenge on Dr. Berg. At the same time, the Rosie who was a dream seed wakes up in the body of Althea, the daughter of a very wealthy family from Texas. Her parents are loving and really do want the best for their only child but soon learn that their Althea may be lost forever and this new Rosie in her place. Both Rosies spend a lot of time and energy trying to figure out what happened to them, process everything new that is happening to them, understand secrets from their past that are revealed, and how to get back at Dr. Berg for destroying their lives. Along the way, they both have to deal with their feelings for Linus, which thoughts and feelings for him are present in both girls. There are so many ups and downs throughout this story that I could not put this book down. I was on the edge of my seat the entire time. I was so involved with this story that I finished it in a couple of days. There was a lot that happened but it all moved at a pace that made me want to keep reading. I loved these characters and the complexities of them. The ending of the book made me scream a little because I could not believe they left it like that! Talk about hooking a reader in so they will finish the trilogy. Overall, I thoroughly enjoyed this book and now cannot wait for the third book. I highly recommend this to everyone. I liked this book so much I gave it four stars.